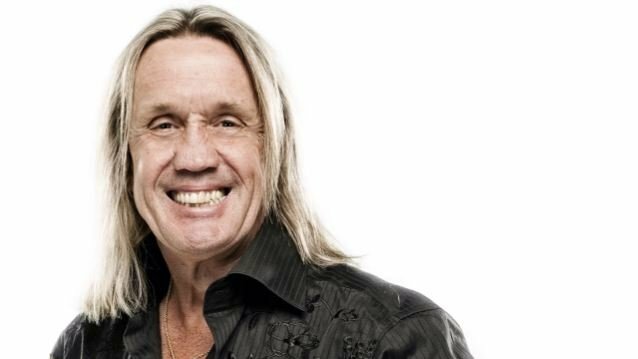 IRON MAIDEN drummer Nicko McBrain spoke to Planet Rock's Paul Anthony last night (Thusday, May 4) about the 2017 leg of the band's "The Book Of Souls" European tour, which kicked off on April 22 at Sportpalais in Antwerp, Belgium. He said (hear audio below): "The first [show in Belgium] was a little bit nerve-wracking, 'cause we hadn't played to a live audience in over six months so it's always… the adrenaline's pumping through the veins and it's, like, 'Oh, gosh, I hope I don't mess this bit up. Oh, I did. Okay!' You know, but you just get on with it." He continued: "Obviously, it's just getting back into the motion of the show. You can rehearse all you like sitting in a room going through the set, but as you soon as you get on the stage, it's a totally different ballgame when you've got, like, twenty thousand kids, or ten thousand kids, or ten — [it] don't matter [how many] — sitting outside, watching you. So there's a lot of pressure on the old nervous system… but stress can be good for you too. It can be good stress, because you're out there doing something you love to do. But there's always the professionalism that we all feel about, you know, we wanna go out and do a great show, primarily for us individually as a band, and then for the kids. So there's a lot of pressure on you on those first few shows." McBrain added: "It took us a couple of run-throughs, and by the time we got to Frankfurt and the second Oberhausen [show], we were pretty much there. So, it's great. And now, being here at Nottingham tonight, it's the beginning of our British tour, as our fans will know. And for those that don't, we're starting our tour tonight in Nottingham. [Laughs] And it's the first British tour since 2010, so we're all really stoked to be back on terra firma and to get going. So watch this space — we'll be coming to a town near you soon." "The Book Of Souls" is MAIDEN's first ever double studio album and their most successful chart-wise to date, debuting at the No. 1 spot in over 40 countries around the world and No. 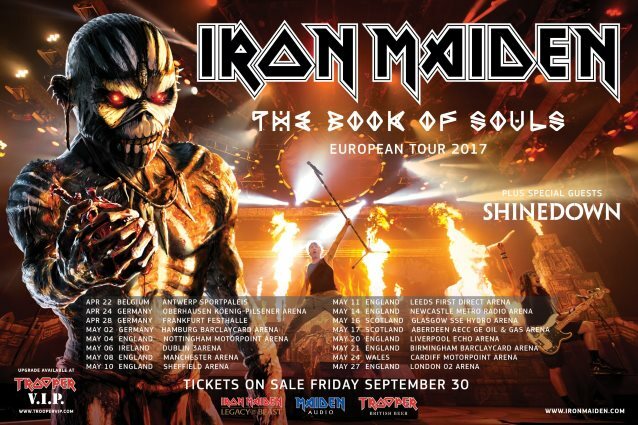 4 in the U.S.A.
IRON MAIDEN's "The Book Of Souls" world tour will return to North America for an extensive series of arena and amphitheater shows in June and July. Support on the trek will come from GHOST.